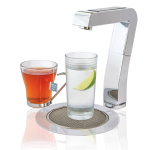 The Instant Tap is an elegant tap system which dispenses boiling and ambient water at the touch of a button, with the water boiler unit discreetly installed underneath the worktop. Adaptable to include a chilling system as well, the Instant Tap is able to meet all your hot or cold water needs, providing limitless and filtered water always at the ready. We aim to schedule the installation of your unit at your earliest convenience. The first step is to arrange a free no obligation site survey to ensure installation is feasible at your chosen location. From there, installation will typically be done within 5 working days. As per the EDWCA guidelines, we sanitise all units every 6 months. The service will be carried out by our EDWCA accredited service technicians and should take no longer than 20 minutes of your time. Installing an Chill Tap benefits not only you and your staff, but also disadvantaged communities in other countries. AquAid supports both Christian Aid and the Africa Trust, donating a portion of revenue to each of these charities, which helps bring life-saving water to those in need.